Bonjour! Here’s another post of my Paris trip with my girlfriends. My vacation in Paris was filled with many wonderful days, but the day that we spent on a private champagne tour in Reims, France will always be one of my favorite memories. That day was the absolute pinnacle of fabulousness! We started our day on the TGV to Reims. Thankfully our 1st class car was nearly empty because as usual, we talked non-stop all the way there. Sydney, our driver and tour guide, met us at the train station with croissants (yum!). She drove us through the lovely town of Reims to our first stop, Reims Cathedral. Even bigger than Notre Dame, Reims Cathedral was breathtaking. It was the site of 25 coronations of the kings of France and is on UNESCO’s World Heritage List. A short walk down the block from Reims Cathedral was our next stop, La Petite Friande chocolate atelier. Although the shop is filled with many wonderful treats, we were there to sample the bouchons, little chocolate corks filled with champagne. Sydney unwrapped a chocolate and demonstrated how we were to pop the entire bouchon in our mouth at once for the ultimate experience. Wow! It was an explosion of champagne – intense and flavorful, like slamming back a shot! That was the most delicious chocolate experience that I had ever had! We bought bouchons for family and friends back home and piled back in the car to begin our tour of champagne houses. Through rolling hills and quaint towns Sydney drove to our first champagne house, Pehu Simonet. Proprietor David Pehu met us in his office, ready to educate us about his champagne and offer us several tastings. I wish that I could tell you all that David shared with us, and the commentary that Sydney provided about David’s small champagne house versus the big champagne houses, but we tasted 4 bottles of champagne, so understand when I say that I don’t quite remember the details of what David said. By the second glass we were all more than a little tipsy and I seriously wondered if we were going to make it through the rest of the day standing upright – this was just our first stop! I asked David to ease up on my champagne because I figured at least one of us had to be sober enough to get us back to Paris. Sydney assured me that after a long lunch we would be fine. Since she did these tours all the time and has surely seen people far worse off than us, I trusted her and continued to taste (albeit half-full glasses; I am a light-weight). Let me pause here to say that I rarely drink alcohol, but if I do, I prefer it to be champagne, Veuve Clicquot if possible. All my friends adore champagne. But I tell you, if you think you have tasted good champagne, you have not until you have tasted champagne like we did, straight from the producer. We were completely and utterly blown away by the smell and taste of this small producer champagne. Each bottle tasted better than the last and we had a hard time deciding which bottle to buy (and that had absolutely nothing to do with the fact that we were drunk by the time we left). But Sydney was right. A 20 minute drive and a two hour, 5 course lunch at Le Grand Cerf sobered us up and by the time we got back on the road, we were ready to drink some more. The entire meal was delicious – bread, soup, seafood ravioli, fish, dessert and cheese plate. From Le Grand Cerf we drove to the champagne house of Le Gallais, which is set on the most beautiful property. 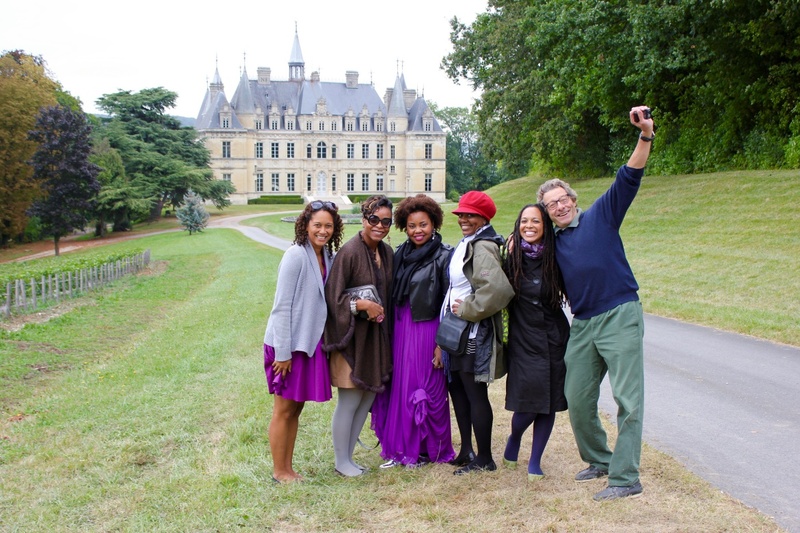 That is Madame Clicquot’s chateau, Boursault Castle, right there on the property. Gorgeous! Hervé Le Gallais welcomed us to his house and made us feel right at home. He explained the champagne process from grape to bottle and stole our hearts with his charm, enthusiasm and warmth. And then a special treat! Hervé led us into his caves to taste a special reserve, vintage champagne. I can’t even describe how amazing that experience was for us, really there are no words. We would have stayed with Hervé all day if we could have; we loved him. Back in car once more, we drove to the town of Épernany and down Avenue de Champagne, which features the leading champagne manufactures like Moët et Chardon and Perrier Jouet. We stopped at Champagne de Castellane for a tour. Champagne de Castellane is one of the oldest families in France and a large producer of champagne. This tour was different than the tours of the small producers; an official tour guide gave us a historical background of the champagne house before leading us past the vats and through the caves. She explained the entire champagne process along the way and we ended the tour with a glass of champagne. If you ever visit France and love champagne, then a trip to Reims is absolutely necessary. It was the highlight of our vacation. I can’t wait to share my champagne with my husband; I think that we will open a bottle this Christmas season. I know that with one sip I will be instantly transported back to France and that wonderful day I spent in Reims. We arranged our private champagne tour with Sydney Krueger of Tasty Side To Life Tours. I highly recommend using Sydney’s services. Before the trip she answered all of our questions and put together a touring day according to our wants. She was professional, but personable and her knowledge of the region and champagne history was impressive. We immensely enjoyed our day with Sydney. It was much colder in Reims than in Paris; dress for warmth. We did not and we were cold. Take the TGV to Reims. After our botched train ride to Versailles, we were nervous about taking the train to Reims, but the Gare de l’Est train station was easy to navigate. Seamless, picturesque and a quick 45 minutes, the TGV ride was lovely. Buy your TGV train ticket at one of the SNCF boutique agencies a few days before your trip. There are many boutiques in Paris; we went to one right next to Jardin du Luxembourg on bd Saint-Michel. You can buy tickets online, but that requires reading the schedule in French. And while you can obviously buy train tickets at the train station, we didn’t want to risk sold out seats. At the SNCF boutique the agent spoke English (and was patient with my broken French) and answered all of our questions. She even told us how to stamp our tickets at the yellow machines before boarding the train. Pay a few dollars more for the 1st class tickets; we practically had the car to ourselves. Bring cash (euros) to buy champagne. While the larger houses will accept credit cards, the smaller houses may not. Expect to buy champagne. You will want to bring some home, so leave room in your luggage (per TSA rules, you won’t be able to carry it on the plane). If you remember to pack bubble wrap, you are exceptional. If not, you can roll your champagne bottles in your clothes. That’s what we did and all of the bottles made it home intact. Champagne bottles are very heavy so your luggage will weigh considerably more on the flight home; plan accordingly. I always pack an extra bag to accommodate my vacation souvenirs. If possible, tour the small producers over the big producers. While the tour of the big producer was educational and nice to see, our experience was richer and more personable with the small producers. I’m glad that Sydney suggested that we see Le Gallais instead of another big producer because it was the highlight of our day. P.S. In the United State and want to order quality champagne? Try The Grateful Palate. Can I customize the private tour? We would love to visit a smaller Champagne House but also Veuve Clipquot. Hi Shannun, yes I believe you can customize the private tour. I don’t know about exactly going to Veuve Clipquot but you can ask! Our tour was custom. I will say that on the small house tours we were the only ones with Sydney and it was very personalized. And on the big house tour we were with others. And Sydney took us, but she didn’t really need to; we could have gone on our own. In other words, if Sydney does not offer that house and you really want to go, just look up the tour times for yourself. Big houses like that have set tour times and dates. I hope that helps! Hi Bonnie – I am so excited for you and your daughter! I still dream about that trip (especially the champagne chocolates at La Petite Friande) and can’t wait to go back someday. When you return let me know how you enjoyed your trip! Could you expand on your experience at de Castellane ? I have not visited even though it has the most amazing looking tower? Also, your readers can purchase the train tickets on the trainline.eu website. Its very easy and in English. You’re the best and LOVE your blog!! I came across your Pin on Pinterest and loved this article. I am a travel blogger and heading to Champagne for the first time this fall. I hope Sydney is still around since this tour sounds amazing! Great article! Sound fun! Thanks for sharing those awesome tips!